The only way to make painting more fun is to add cookies! I mean really how can you go wrong with delicious brightly colored paints, a paint brush and a blank sugar dough canvas. 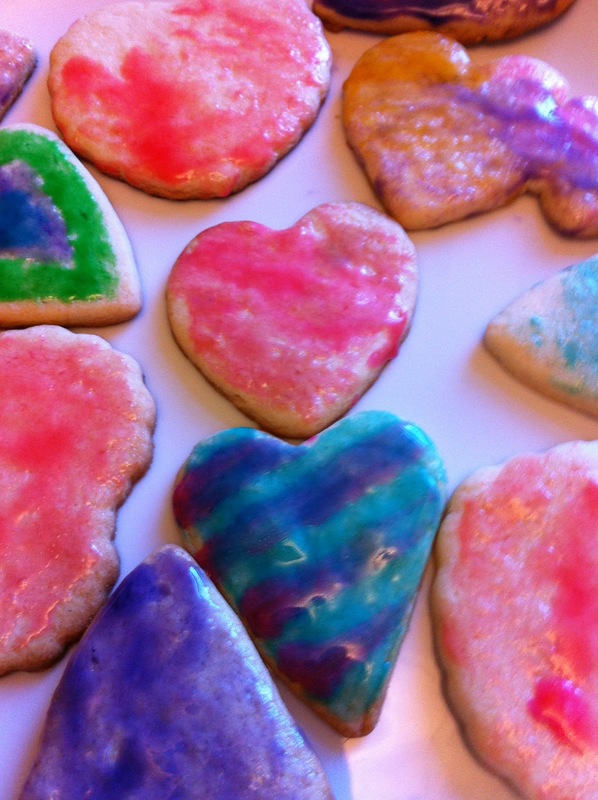 We started our painted cookies by making a sugar cookie dough, which I will confess was just a box mix. We then rolled out the dough and used our heart cookie cutters since it seemed the most seasonally appropriate of all the cookie cutters we have. I then mixed up the "paint" using 1/2 stick of butter, 1/3 cup of milk and a teaspoon of vanilla in a sauce pot over a medium heat. Once those ingredients had all melted together I took the pot off the heat and mixed in confectioners sugar until it was the consistency of tempera paint. 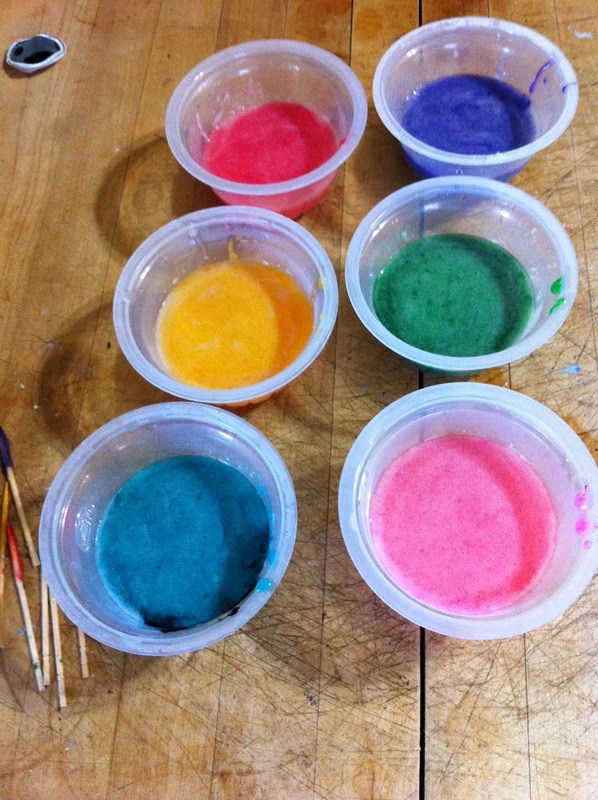 I then divided the frosting up into small plastic cups and added a few drops of food coloring to each one. The Bee was in charge of the mixing and with in just a few minutes we had a beautiful palette. After the cookies had cooled I set up both the girls with a plate and a brush and they got right to business. To my surprise neither one of them tried to put anything in their mouth, which is ironic because this is the one time they could have. The Bean only made it through painting one cookie before she started eating, a girl after my own heart. I only painted one or two before I gave over to the temptation but the Bee diligently painted the rest of the cookies only taking one quick break to sample her art. I was so impressed by how beautifully these cookies turned out, I don't think the photo really does it justice. The cookies were also delicious, the "paint" added just a little sweetness and you could probably add a flavoring like lemon to give them even more zing!